This list presents the full set of buildings, structures, objects, sites, or districts designated on the National Register of Historic Places in Southwest Portland, Oregon, and offers brief descriptive information about each of them. The National Register recognizes places of national, state, or local historic significance across the United States. Out of over 90,000 National Register sites nationwide, Oregon is home to over 2,000, and over one-fourth of those are found partially or wholly in Portland. 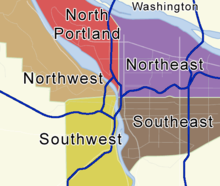 While these sites are widely spread across all five of Portland's quadrants, heavy concentrations are found in the Downtown and Southwest Hills neighborhoods of the Southwest quadrant, and the Northwest District neighborhood of the Northwest quadrant. 45°30′27″N 122°42′06″W﻿ / ﻿45.507586°N 122.701572°W﻿ / 45.507586; -122.701572﻿ (Maud and Belle Ainsworth House) Maud Ainsworth was a prominent Northwest photographer in a cutting-edge, modernist style. The 1907 Arts and Crafts house she shared with her sister Belle included her studio and darkroom. The house is a defining work of architect William C. Knighton, a designer of importance throughout Oregon. 45°31′04″N 122°40′55″W﻿ / ﻿45.517889°N 122.681833°W﻿ / 45.517889; -122.681833﻿ (Arlington Club) A four-story brick and terra cotta structure built in 1910. 45°30′59″N 122°40′34″W﻿ / ﻿45.516447°N 122.676152°W﻿ / 45.516447; -122.676152﻿ (Auditorium and Music Hall) One of the few remaining Romanesque Revival buildings in Portland, this 1890s building housed concert space, a commerce center, a dance hall, apartments, a boxing gym, and offices through its history. 45°30′05″N 122°42′33″W﻿ / ﻿45.501408°N 122.709211°W﻿ / 45.501408; -122.709211﻿ (Baruh–Zell House) Leading Portland residential architect Herman Brookman's design for this 1937 Tudor Revival house was one of his finest achievements. In many of its features, such as curved walls, stripped-down ornamentation, recessed entry, and functionally-oriented rear elevation, it heralds the transition from highly traditional European styles executed on a grand scale to a modernized and simplified reinterpretation of those styles responsive to contemporary technology and preferences. 45°30′16″N 122°41′55″W﻿ / ﻿45.504435°N 122.698745°W﻿ / 45.504435; -122.698745﻿ (John M. and Elizabeth Bates House No. 1) Architect Wade Pipes, a pivotal figure in the Arts and Crafts movement in Oregon, designed this house in the mid-1930s. Built in 1935, it represents that decade's transition in Pipes' focus from English vernacular exterior elements toward clean lines, rectilinear forms, and minimal decoration. Its interior spaces and details express his devotion to Arts and Crafts principles. John and Elizabeth Bates subsequently commissioned three further houses from him. 45°30′44″N 122°41′07″W﻿ / ﻿45.512258°N 122.685409°W﻿ / 45.512258; -122.685409﻿ (Simon Benson House) Was originally listed in 1983 at its original location at 1504 SW 11th Avenue. Was delisted and relisted on the same day in 2002 after it was moved to its present location. 45°31′09″N 122°41′00″W﻿ / ﻿45.519140°N 122.683202°W﻿ / 45.519140; -122.683202﻿ (Central Building, Public Library) Architect A.E. Doyle's 1913 public library building was one of the first open plan libraries in the US. It has become the core of the Multnomah County Library system. 45°31′14″N 122°40′57″W﻿ / ﻿45.520568°N 122.682637°W﻿ / 45.520568; -122.682637﻿ (Elks Temple) Building currently serves as the west wing of the Sentinel Hotel. 45°31′04″N 122°40′53″W﻿ / ﻿45.517665°N 122.681309°W﻿ / 45.517665; -122.681309﻿ (Heathman Hotel) Not to be confused with the current Heathman Hotel, which is also listed on the National Register, as the New Heathman Hotel. 45°31′16″N 122°41′13″W﻿ / ﻿45.521097°N 122.687036°W﻿ / 45.521097; -122.687036﻿ (Hyland, Olive and Ellsworth Apartments) Constructed in 1905 during Portland's period of rapid growth around the Lewis and Clark Centennial Exposition, this was one of the city's earliest modern apartment buildings. The property is closely associated with three generations of the Bronaugh family, who were prominent in Oregon law and politics. 45°30′43″N 122°41′37″W﻿ / ﻿45.511921°N 122.693736°W﻿ / 45.511921; -122.693736﻿ (A. G. Long House) This 1908 house is perhaps the finest example of residential Colonial Revival architecture from the years soon after the style was introduced to Portland. It is additionally notable for its unusual admixture of Craftsman elements to the overall Colonial form, especially on the interior. 45°30′27″N 122°42′10″W﻿ / ﻿45.507519°N 122.702839°W﻿ / 45.507519; -122.702839﻿ (Daniel J. Malarkey House) This was the home of noted legislator and trial lawyer Dan Malarkey (1870–1939) from its construction in 1909 until his death. Associated with Progressive causes, Malarkey presided over the Oregon Senate during its 1913 session, when the legislature passed landmark bills establishing a minimum wage and regulating public utilities. In private legal practice, he played a key part in the ultimately successful battle against the 1922 Oregon School Law. 45°30′38″N 122°43′05″W﻿ / ﻿45.510439°N 122.718173°W﻿ / 45.510439; -122.718173﻿ (William F. Mangels Four-Row Carousel) As of 2013, the carousel is no longer located at these coordinates or address. 45°31′07″N 122°40′42″W﻿ / ﻿45.518624°N 122.678360°W﻿ / 45.518624; -122.678360﻿ (Pioneer Courthouse) Built in 1875 and restored in the 1970s, this was one of the first monumental buildings in the Pacific Northwest. It has served as a U.S. courthouse, a customhouse, and a post office. It underwent another rehabilitation in the 2000s. 45°31′23″N 122°40′18″W﻿ / ﻿45.523111°N 122.671569°W﻿ / 45.523111; -122.671569﻿ (Portland Skidmore/Old Town Historic District) One of the most impressive historic commercial districts on the West Coast, this is where Portland began and first flourished. The buildings, which date from the mid-to-late-19th century, were built in a variety of High Victorian architectural styles, and many feature cast iron fronts. Also extends into Northwest Portland. 45°31′14″N 122°40′56″W﻿ / ﻿45.520553°N 122.682167°W﻿ / 45.520553; -122.682167﻿ (Seward Hotel) Building currently serves as the east wing of the Sentinel Hotel. 45°30′54″N 122°40′24″W﻿ / ﻿45.514969°N 122.673253°W﻿ / 45.514969; -122.673253﻿ (Visitors Information Center) In this, his only major non-residential commission, master architect John Yeon combined the principles of the International style with strong influences of the Northwest Regional style, which he pioneered. Northwest Regional elements include the naturally-inspired color scheme, the use of plywood walls and louvered ventilation panels, and concern for the site's unique views. 45°30′53″N 122°41′53″W﻿ / ﻿45.514600°N 122.697986°W﻿ / 45.514600; -122.697986﻿ (Cora Bryant Wheeler House) Architect A. E. Doyle designed this 1923 Arts and Crafts house, with its complex lines and massing, to take full advantage of its prominent and demanding ridgetop location. The Wheeler House became an important later addition to the portfolio that made Doyle one of Portland's leading architects. Junior partner Pietro Belluschi and apprentice Richard Sundeleaf provided on-site construction supervision. 45°30′28″N 122°41′57″W﻿ / ﻿45.507698°N 122.699141°W﻿ / 45.507698; -122.699141﻿ (Walter S. Zimmerman House) Architect Wade Hampton Pipes (1877–1961) was the most prominent advocate of the English Arts and Crafts movement in Oregon during his active career (beginning 1911). This 1931 house, designed for logging and railway businessman Walter Zimmerman, represents a transitional step in the evolution of Pipes's work, moving from traditional stucco walls to brick and adding other modern details. 45°31′11″N 122°41′31″W﻿ / ﻿45.519765°N 122.692057°W﻿ / 45.519765; -122.692057﻿ (Zion Lutheran Church) Master architect Pietro Belluschi employed a number of innovations in this 1950 church, a pioneering example of the application of modern architectural principles to a religious building. Using local materials, influences, and artists and craftsmen, it represents the Northwest Regional style of modern architecture, which Belluschi originated and developed. This 1931 house was designed by J.O. Frye to resemble Canterbury Castle in England on the exterior, and to evoke the Art Deco styling of Hollywood of the 1920s on the interior. It was demolished in 2009 after failing to meet municipal safety codes. (#79002131) April 14, 1989 2601-2605 SW Water Ave.
(#83002171) May 20, 2003 1520 SW 11th Ave.
^ Hotel Ramapo was previously listed on the National Register as "Franklin Hotel". Updated documentation accepted by the Keeper on January 2, 2013, showed that the "Franklin Hotel" name was in error; the building has never been referred to by that name. Accordingly the name listed on the National Register has been corrected. ^ The Ladd Carriage House was originally listed on the National Register on February 12, 1980. It was delisted on January 4, 2008 due to a temporary relocation to accommodate construction of underground parking in 2007. After a successful conclusion to the temporary relocation, substantially retaining the carriage house's historic integrity on its original site, it was relisted on January 7, 2010. ^ The Portland Skidmore/Old Town Historic District's National Register nomination form states that the east boundary of the district is Harbor Drive, a thoroughfare which was removed subsequent to the district's listing on the National Register. The Willamette River is used here as an approximation of the alignment of Harbor Drive. ^ Ferriday, Virginia Guest (August 1985), National Register of Historic Places Inventory—Nomination Form: Ainsworth, Maud and Belle, House (PDF), retrieved April 18, 2012 . ^ Bingham, Larry (September 14, 2010). "Arlington Club lands spot on National Register of Historic Places". The Oregonian. Retrieved September 15, 2010. ^ "Stumptown Stumper". Portland Tribune. July 24, 2008. p. A4. Archived from the original on June 8, 2011. Retrieved March 1, 2015. ^ Fitzgerald, Kimberli; McFeeters-Krone, Amy (June 2006), National Register of Historic Places Registration Form: Baruh–Zell House (PDF), retrieved February 25, 2013 . ^ Beckham, Stephen Dow (December 1989), National Register of Historic Places Registration Form: Bates, John M. and Elizabeth, House No. 1 (PDF), retrieved November 15, 2013 . ^ Multnomah County Library (July 10, 2008). "History – Multnomah County Library". Retrieved January 23, 2009. ^ Gragg, Randy (September 24, 2006). "Recycling the Armory". The Oregonian. Portland. p. O1. ^ Evans, Gail E. H. (April 26, 1979), National Register of Historic Places Inventory — Nomination Form: Hyland, Olive and Ellsworth Apartments (PDF), retrieved November 8, 2013 . ^ Spencer-Hartle, Brandon; Engeman, Jessica (June 15, 2009), National Register of Historic Places Registration Form: Ladd Carriage House (PDF), retrieved February 10, 2014 . ^ Demuth, Kimberly (August 9, 1993), National Register of Historic Places Registration Form: Long, A. G., House (PDF), retrieved August 18, 2013 . ^ Demuth, Kimberly (November 12, 1992), National Register of Historic Places Registration Form: Malarkey, Daniel J., House (PDF), retrieved August 21, 2013 . ^ a b National Park Service. "National Historic Landmark Program: NHL Database". Archived from the original on June 6, 2004. Retrieved December 27, 2008. ^ Olson, Gregg; Sutton, Robert K. (September 4, 1975), National Register of Historic Places Inventory — Nomination Form: Portland Skidmore/Old Town Historic District (PDF), retrieved November 17, 2013 . ^ Minor, Kristen (February 20, 2010), National Register of Historic Places Registration Form: Visitors Information Center (PDF), retrieved July 5, 2013 . ^ Fiscus, James; Darby, Melissa (July 31, 1989), National Register of Historic Places Registration Form: Wheeler, Cora Bryant, House (PDF), retrieved July 5, 2013 . ^ Tess, John M.; Ritz, Richard E. (July 15, 1990), National Register of Historic Places Registration Form: Zimmerman, Walter S., House (PDF), retrieved July 3, 2013 . ^ Farr, Libby Dawson; Grams, Theodore C.W. (July 26, 1995). "National Register of Historic Places Registration Form: Zion Lutheran Church" (PDF). Retrieved August 22, 2013. ^ a b Oregon Parks and Recreation Department (August 8, 2008). "Oregon National Register List" (PDF). Retrieved October 9, 2008. ^ National Park Service (October 22, 2010). "Weekly List of Actions Taken on Properties: 10/12/10 through 10/15/10". Retrieved October 22, 2010. ^ Lednicer, Lisa Grace (May 28, 2009). "Portland's Canterbury (Lane) Castle is coming down". The Oregonian. Portland. Retrieved October 22, 2010. ^ a b c d National Park Service (March 27, 1998). "Weekly List of Actions Taken on Properties: 3/16/98 through 3/20/98". Retrieved October 22, 2010. ^ a b National Park Service. "Weekly List of Listed Properties: 1995" (PDF). p. 4. Retrieved December 17, 2011. ^ National Park Service (May 30, 2003). "Weekly List of Actions Taken on Properties: 5/19/03 through 5/23/03". Retrieved March 1, 2015.